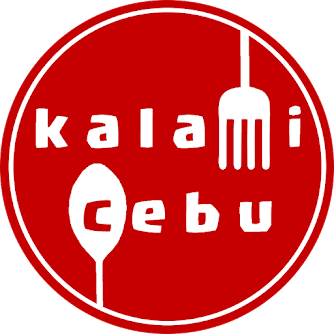 Christmas is synonymous to lechon in Cebu. During the Christmas season, you will probably eat lechon every day if you love going to Christmas parties here in the Queen City of the South. I lived in Manila before and they do not eat as much lechon as an average Cebuano. Since people living in Cebu eat so much lechon, each one of us has a favorite part. Here is my take on the most delicious parts of the lechon. We all love a freshly roasted lechon. 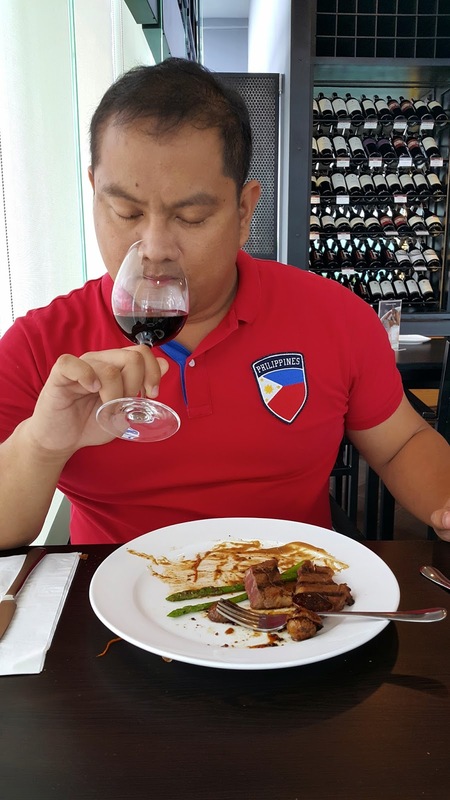 It's delicious, crispy and so Filipino! 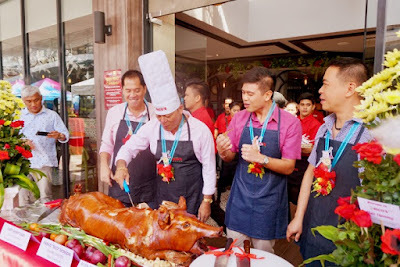 I would say lechon is part of Filipino culture. It is one of our great culinary contributions to the World. Yes, we might not be the first ones to roast a pig but arguably we have the best roast pig in the world. Just ask Anthony Bourdain. I have been eating lechon since I was little and I know which part I will target when there is an untouched lechon right in front of me. The answer is not simple because most of us will just say the skin. 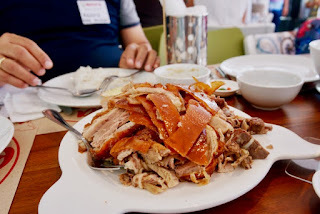 One time, I attended a wedding in Bohol and when the host said it was time to eat, the guests attacked the lechon skin then they left the lechon as a carcass of white meat and fat. It was not pretty. Lechon meat is meant to be eaten as well. The skin may be the obvious choice but the lechon has many other enjoyable parts. 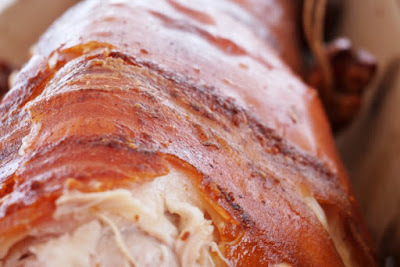 Skin - Who doesn't love lechon skin? 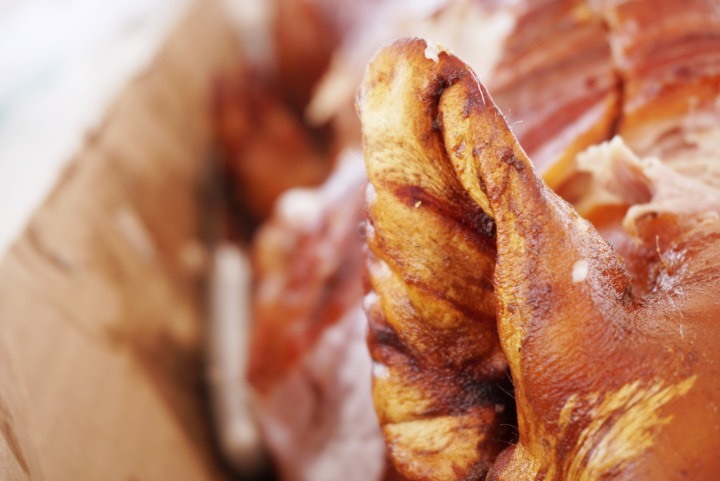 The red, shiny, and crispy skin is what makes lechon different. As long as the skin is crispy, I am pretty sure that nobody will refuse a bite or two. This part is pretty exempted from the list because it is a no-brainer. Even leftover skin can be refried to a crisp and still beat out other viands in an ordinary day. Ribs - A lot of flavors are in the bones and the ribs are a perfect spot to catch them all. Lechon is hollow inside and the spices and flavorings are stuffed in the belly area. This makes the ribs one of the tastiest parts of the roasted pig. Belly - This is the tastiest part for me because of gravity. Every juice will definitely settle in the underbelly. 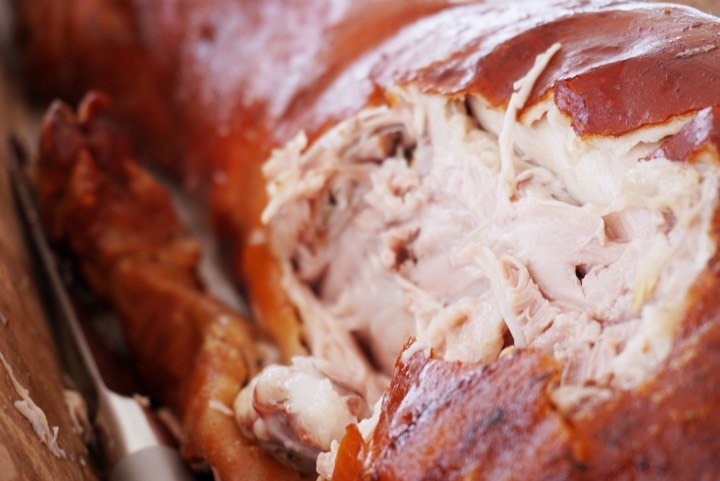 If your lechon is seasoned well, that moist belly meat will surely pack all the flavors of your lechon. You just have to be careful and not eat too much because this part is also the saltiest. Eat in moderation and everything will be good. Shoulder - The shoulder area is meaty and this is the favorite part of Cebu's Lechon King Enrico Dionson of Rico's Lechon. It does not have any bones, unlike the ribs, making it a good choice when buying lechon by the kilo. Ear and the face - A lot of people buy the head of the lechon. It is cheap but it has some interesting parts. The face contains a lot of crunchy skin which sometimes people convert to sisig. The cheeks have delectable meat. 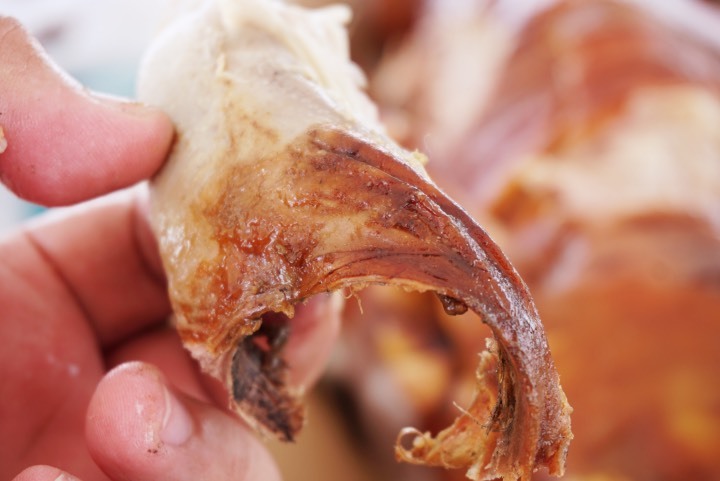 Many also love to nibble the lechon ears because it's probably one of the crunchiest parts that you can find. Tongue - Another exotic body part is the tongue. Every lechon has only one tongue and this part are for those who likes eating unique body parts of animals or offal. The tongue contains lean meat. It could be a bit chewy but I actually enjoy eating it. 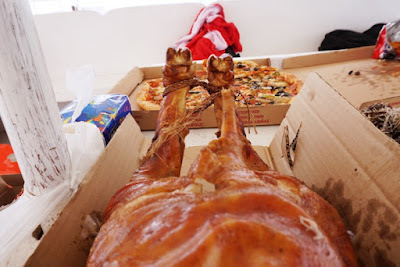 Legs - If you are a big fan of Crispy Pata, you know that legs have some succulent meat. Its texture is different and it is softer than meat found in the shoulders. By the kilo, the legs are sold at a cheaper rate. Tail - Just like the tongue, a lechon has just one tail. It is like the ear and it is composed of mostly skin. When we have a party at home and we are still not allowed to eat, I usually just pull the tail sneakily and eat it. I can eat any part of the lechon but my personal favorite is definitely the belly. I really love the thin meat in the underbelly. I love its saltiness and I do not need any sauce when I eat that part. How about you? 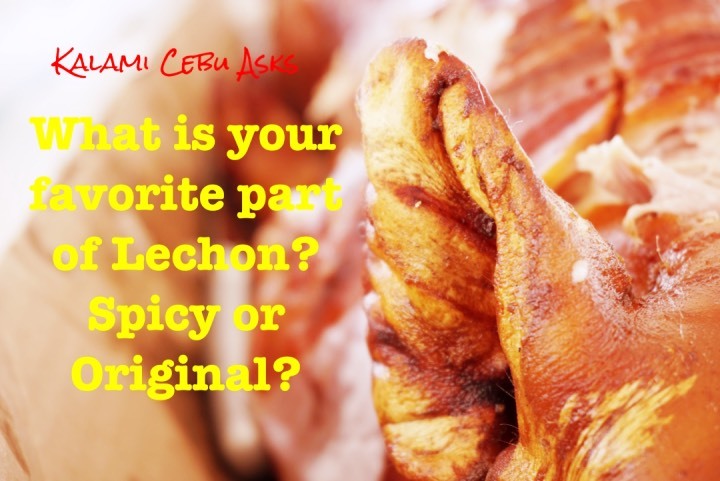 What is your favorite lechon part? Do you love the popular choices like the ribs and belly or would you prefer the unusual ones like the tongue and ears? Share your answers please by making a comment. 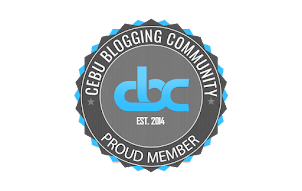 Why Cebu Should Support VisPop Music Festival? Why Liv Super Club Will Become the Premier Club Brand in the Visayas and Mindanao?